When we talk about people’s power we are not thinking about putting our leaders into the very same structures. We do not want Nelson Mandela to be the state President in the same kind of parliament as Botha. We do not want Walter Sisulu to be Chairperson of a Capitalist Anglo-American corporation. So said a United Democratic Front pamphlet called “Building People’s Power” that was produced in the 1980s. It continued, “We are struggling for a different system where power is no longer in the hands of the rich and powerful. We are struggling for a government that we will all vote for.” The UDF, formed in 1983, was a coalition of anti-apartheid community, church, worker, youth, sports and other groups. Along with forces like the “workerist” Federation of South African Trade Unions it played a key role in resistance. What the UDF wanted sounds like almost the exact opposite of what actually happened: more than 20 years later, it is not Sisulu who is chairperson of Anglo-American Corporation, but the ANC’s Cyril Ramaphosa, the Butcher of Marikana, who is a shareholder on the capitalist Lonmin Corporation. Even though people have the right to vote now, fewer and fewer people are actually voting because they don’t get what they vote for; and power and wealth are still in the hands of the rich and powerful. What went wrong, and what lessons we can draw? What are some of the similarities between the 1980s and today? What is the way forward? Before there was the Congress of South African Trade Unions, today’s COSATU, there was FOSATU. FOSATU was set up in 1979. There had been strikes and struggles in the 1970s, starting with a big strike wave in Namibia from 1971-1972, which was then a South African colony, then a big strike wave starting in Durban 1973, which spread around the country. Although we remember 1976 for the bravery of the youth and students, we must remember that the 1976 uprising also involved general strikes by the black working class, mass stay-aways. And as the working class started to flex its muscles, and to organise new, independent unions, the need for unity was felt. In 1979, at Hammanskraal, FOSATU was set up. The flag of FOSATU was red, black and gold, with a hammer, a spanner and a spade. FOSATU grew quickly, despite repression by the apartheid state. Leaders and activists in FOSATU were banned, jailed; some, like Andries Raditsela, were murdered by police. There was continual intimidation, and employers would fire workers for going on strike or “agitating” at work. Unemployment is not just about money: unemployment is a weapon of the bosses, and this weapon was used many times against FOSATU. EDITOR’S INTRODUCTION: Today the terms “populism” and “workerism” are widely thrown about in South African political circles. Often, these terms and others (“syndicalism,” “ultra-left,” “counter-revolutionary,” “anti-majoritarian” …) have no meaning: they are just labels used to silence critics. SA Communist Party (SACP) leaders do this often. But in the 1980s, “populism” and “workerism” referred to two rival positions battling for the soul of the militant unions. FOSATU was launched on 14 and 15 April 1979 at Hammanskraap. 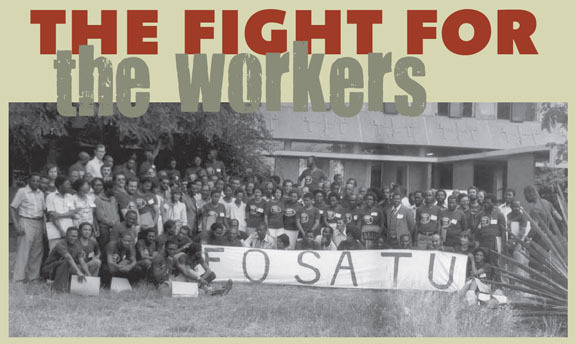 Workers’ democracy and control were the core tenets upon which FOSATU was founded.